I do believe this has been our busiest summer so far. So busy that I am *just now* gearing up for our 2013/2014 homeschool year! We will begin the first week of September. So I have about 2 weeks to get a plan and to organize that plan. As with anything I do, I like to have things really FRESH. Meaning, I want to completely clean the area, top to bottom before we start. 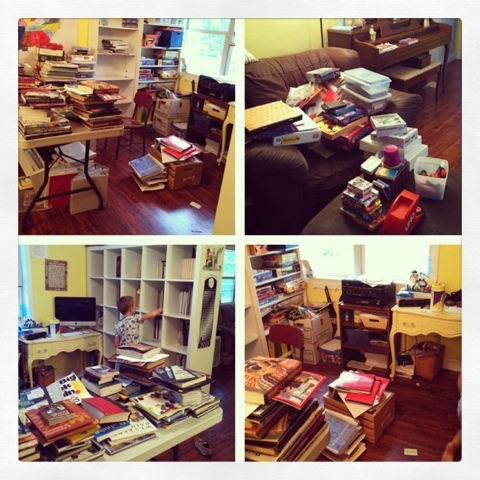 I want to rearrange, make things more organized and easy to access and to find. Pulling out books, Rearranging books, Sorting through books. If I am not back in the morning, it's because I am under a stack of books somewhere in my home. I hear that!!! We were actually going to start today, but I got way sick over the weekend and still in recovery mode. I told the kids we would start on Wednesday, but I still need to go through everything like you are currently doing. There's no where I'd rather be than in the garden or under a pile of books. Enjoy and good luck! I've been under that same pile of books....and was excited just as you are. Those were some of the best days. Now I have one *kid* in 11th grade. The happy chaos is a thing of the past.